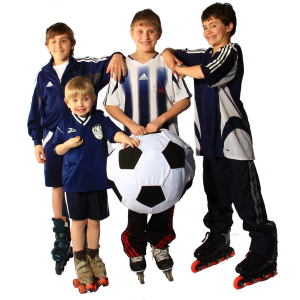 Our Team Sports Parties are great for a start of the season social event or an end of the season celebration! You get the Private VIP Glow party room for 2.5 hours along with food, and refreshments for your team. These are great parties for ball teams, cheerleading teams, dance teams, etc. Parties require a $50.00 deposit at the time of reservation and a “lead time” of three days to book online. If you are looking for a time within three days please call us at 763.427.8980. For larger groups of 30 or more, another great option for Team Sports Parties would be our to have a private party. Private parties start at $350.00 for a 2 hour rental. For more details on a private party package, please call us. Additional pizza and soda pitchers available for purchase on day of event. No charge for non-skating parents and adults. Saturdays may not be available during peak season. Please call for availability! Making a reservation is now easier than ever. Simply complete and submit the following form. Once your request is received, we will review the details and contact you as soon as possible. Please allow 1-2 business days to process your request, or the following Tuesday if reserving on the weekend. **$50.00 non-refundable deposit required on confirmation / $75.00 for private parties** Please call us if you need to book a party with short notice. *All fields are required unless noted.All information submitted to Cheap Skate via this form will be held strictly confidential. It will not be shared or to sold to any third parties. It will remain the property of Cheap Skate. The selected room time does NOT limit your time at Cheap Skate. It only limits your time in the party room. You are welcomed to stay as long as you like. We find that the average party last 3 - 4 hours. Want to add additional items to your party? Click to choose your add-ons above. If you selected a Party Extra, how many will you need? Please email me regarding future promotions and events.